In support of our members and the people they serve, AUCH helps reduce barriers to healthcare through health promotion, community engagement and development, education, and policy analysis. 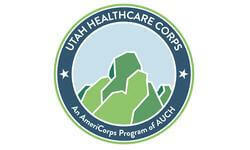 The Utah Healthcare Corps' (UHC) parent organization is the Association for Utah Community Health (AUCH). AUCH has served as the federally recognized Primary Care Association (PCA) in Utah since 1985. AUCH is a private, not-for profit 501(c)(3) corporation with fifteen organizational members, including the thirteen HRSA, BPHC, Section 330 HC grantees. AUCH and its member organizations are part of a statewide and national movement to improve the quality of and access to comprehensive healthcare services. Since 1995, the Utah Healthcare Corps (UHC) placed more than 500 AmeriCorps Members (Members) in Utah’s Health Resources and Services Administration (HRSA), Bureau of Primary Healthcare (BPHC), Section 330 Health Centers (HCs) and community-based health organizations (CBHOs). Members facilitate access to healthcare and address social determinants of health (SDOH), which include social and economic conditions that influence community and individual health among Utah’s vulnerable and medically underserved.